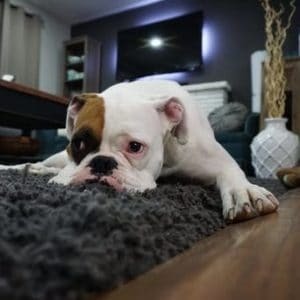 February 15, 2018 0 comments on "How to Remove Dog Urine Stains from Carpet"
Do you have old dog urine stains in your carpet? You may have tried EVERYTHING to get them out. Well don’t give up yet! Here are some of my favorite expert tips for removing dog urine stains from carpet. Our favorite tip: Our readers have tried many alternatives to get rid of dog and cat urine or pee smells over the years, and by far the most popular option has been an inexpensive ozone machine that effectively gets rid of dog urine smell and other stubborn odors in a room for good (and it doesn’t just mask the smell). An enzyme cleaner will help get rid of stubborn stains out of your carpet. Tip #1: If you can catch it while it is still wet this will work wonders. Salt. Plain old table salt. Cover the area of the carpet GENEROUSLY with salt and leave it alone for at least 2 hours. The salt will “draw” the moisture out of the carpet. Then you can just sweep/vacuum it up later. This works great on any kind of carpet stain. Tip #2: Try vinegar. I use this all the time. Pour the vinegar directly on the fresh or dried urine stain – I would use 1/2 cup if this really is a small stain. Then put a towel over the spot and step on it to remove the liquid. The vinegar will remove the urine smell and the vinegar smell will disappear soon. If a stain remains, rub the area with a baby wipe. Tip #3: Get as much of the stain up with blotting as possible, spray Shout onto the carpet, and gently scrub with a damp cleaning rag or two, depending on how large the area is. Occasionally it takes two times, but usually works in one. Tip #4: I have two older cats that occasionally pee on the dining room floor. I tried everything to get the stains up, and eventually the only thing that really worked was OxyClean. I buy a bucket of it at my grocery store, and in a separate container create a watery paste with it. Then apply it on the entire area and work it in with a brush. Then I rinse it with water and vacuum it up with our wet vac. I was shocked at how well it worked. There was no yellowing left at all. Tip #5: There are two things you could try. One being a mix of hydrogen peroxide and about half the same amount of ammonia. Spray this and let it sit for about 30 seconds and blot with a dry towel. Tip #6: If it’s on the carpet try using a product with enzyme in it. Dollar tree sells that stuff in the pet section. It’s called Dog’s best friend or something like that. It is a urine remover. It really works.